A big bold going chestnut with a striking white blaze, Oxford Poet (5g Dylan Thomas x Oxford Princess, by Magic Ring) scored a well-deserved stakes success at Rosehill on Saturday in the Listed ATC Winter Stakes. Turned out in top order by Kim Waugh and rated perfectly in front by Tim Clark, Oxford Poet controlled the race and gave a great kick to hold off the challenge of Zin Zan Eddie to win the 1400 metre feature by a neck. 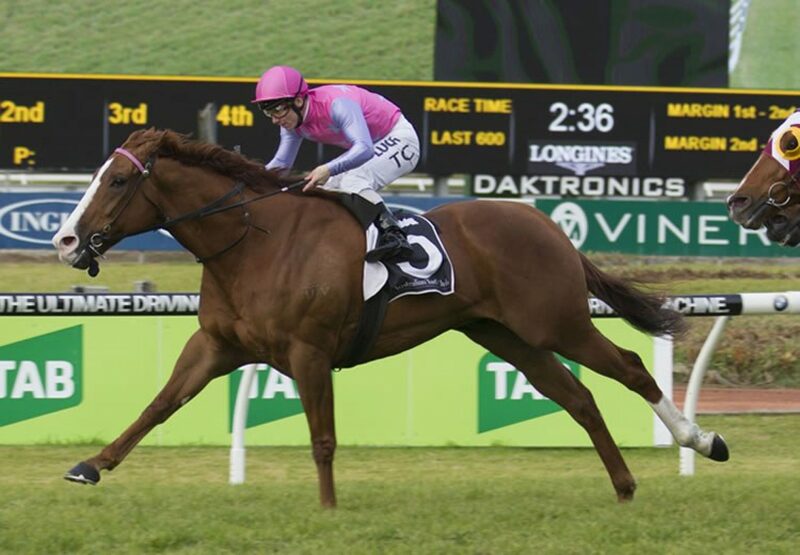 "Last start he just went a little bit keen and he was a little bit fresh being three weeks between runs but I knew he was spot on today,” Waugh said. "I was just holding my breath and he did what he does best. "He deserves to win this today because he’s been so close in a lot of black type races.” Retained to race, Oxford Poet has been handled patiently by Waugh and has put together an impressive record winning five races and placing 12 times from 22 starts earning prizemoney of $478,050. The 24th stakes-winner worldwide for Dylan Thomas, Oxford Poet is a half-brother to stakes-placed Oxford Heart and is from Oxford Princess, a half-sister to the dam of another brilliant chestnut stakes-winner with a blaze in Ladys Angel.